Tents for camping come in various sizes, shapes, and styles. There are cabin tents, dome tents, A frame tents; 1 person to 12 person or more. You can sleep in luxury or rough it. There is something for everyone. If you want luxury try the camping trailers. If you want to rough it try a tarp tent or hammock tent. And then there are the many camping tents in between . Personally I prefer luxury to roughing it. Although when you rough it you have less to cart. Backpackers who hike to a campsite carry light weight tents. To me a small 1 person or 2 person tent is much better than a tarp tent if you don't want to deal with bugs crawling on or around you. 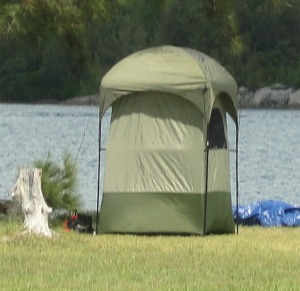 On the other end are the family cabin tents, usually big and heavy. 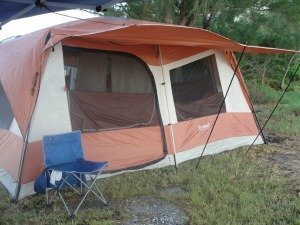 Camping with your family may mean that you need to take other tents along with your sleeping tent, such as a screen tent or canopy tent for your kitchen, and a shower or privacy tent. Have you seen the Outwell family tents? They are big. Some look like hotel suites. Must be the cold weather temperatures they have even in the summer. While I admire them most seem to have plastic windows; I need screens for 70 to 85 degree temperatures plus humidity that I camp in. Then there are the 3 season and 4 season tents for camping. 4 season tents tend to have less windows to keep the inside warm in the winter. 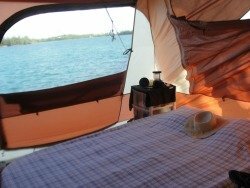 While the 3 season tents are great for warm weather camping and spring and fall. 3 Season tents tend to have big windows to let in the air. Some people like canvas tents. Canvas is what tents used to be made of. When I first started camping 30 odd years ago we used canvas tents. Canvas tents are still around, but you'll have to pay. Most tents are made of nylon which is lighter than canvas. There are also pop up or instant up tents, not just the EZ Up canopies, but tents for sleeping in. These type of tents have the poles already attached to the tent so you don't have to figure out what pole goes where, or losing them. You just open up the tent lift, pull, or tug. On my Camping Trailer page, I talk about tents that flip open on top of trucks and cars, but an SUV and Truck Bed Tent are a little different. If you appreciate this content please like this page, thanks.